DONETSK, Ukraine -- Russian rocket launchers seen moving through eastern city as Ukraine's PM says his country is in 'stage of war' with Russia. 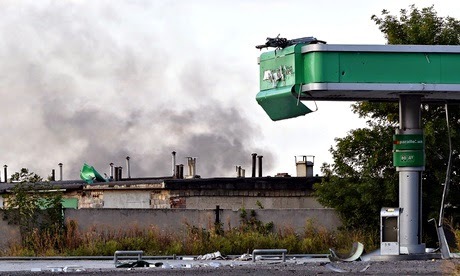 Smoke rises from Donetsk international airport during battles between pro-Russia forces and the Ukrainian army. Ukraine's military says it has successfully defended the government-held airport in Donetsk from an attack by pro-Russia rebels. A large plume of black smoke hung over the airport after it came under artillery fire late on Friday, in one of the biggest battles since a fragile ceasefire was declared. Continuous rocketfire could be heard overnight in the city of Donetsk, controlled by pro-Russia forces. City officials said shells had hit residential buildings near the airport, although no casualties were reported. A column of three Russian multiple rocket launchers was seen moving freely through Donetsk on Saturday morning. The latest fighting comes as Ukraine's prime minister, Arseny Yatseniuk, accused Russia's president, Vladimir Putin, of wanting to destroy Ukraine as an independent country and resurrect the Soviet Union. Speaking at a conference of European politicians, he said his country was "in a stage of war" with Russia, as Moscow sent a second convoy of trucks into Ukraine without Kiev's consent. He said: "We are still in a stage of war and the key aggressor is the Russian Federation … Putin wants another frozen conflict [in eastern Ukraine]. "His aim is not just to take Donetsk and Luhansk. His goal is to take the entire Ukraine … Russia is a threat to the global order and to the security of Europe." For the first time since the start of the ceasefire, agreed on 5 September, the Ukrainian National Security and Defence Council also admitted it had inflicted casualties on the rebel side. A spokesman said that 12 rebel fighters had been killed by Ukrainian forces outside the city of Mariupol, near the Sea of Azov. He said that six Ukrainian servicemen had also died since the start of the truce. The ceasefire agreement has been riddled by violations since it was imposed last week, but Ukrainian president Petro Poroshenko said on Friday it was a "fragile but efficient peace process." On Saturday, Russia sent a convoy across the border, but Ukraine's top leaders have remained largely silent, underscoring how dramatically the mood has shifted in the Kiev government since a ceasefire deal was struck. Russian reports claimed the convoy was loaded with humanitarian aid, but the border crossing did not have the approval of Kiev or oversight of the international Red Cross. A similar convoy in August was loudly condemned by Ukrainian officials as an invasion, but this time around Lysenko simply called the move "illegal." He said: "Ukraine border guards and customs were not allowed to examine the cargo and vehicles. Representatives of the Red Cross don't accompany the cargo, nobody knows what's inside." Russia's foreign minister, Sergei Lavrov, said on Saturday that was in everyone's interests for the Ukraine to avoid alignment with NATO. He said Ukraine's non-aligned status is "a basic issue" for Moscow and efforts in Kiev to scrap it are an American-inspired bid to drive a wedge between Russia and Europe. Lavrov, commenting on a draft law to change Kiev's military status, said neutrality "answers the interests of the Ukrainian people, the legitimate interests of all neighbours and partners of Ukraine, and also the interests of European security." In an interview with the Russian television channel TV Centre, he said the Ukrainian prime minister "is undertaking efforts not in the interests of his own country, but of those who want to sow discord between the Ukrainian and Russian peoples and drive a deep and wide wedge between Russia and Europe".